Notes: PRR Class FF-2; Enola, PA. Description: Here are two photos taken by Mr. Paul Carleton. 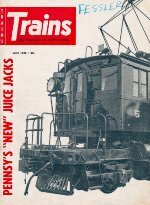 They were published originally in the October 1957 issue of "Trains" magazine, page 8. 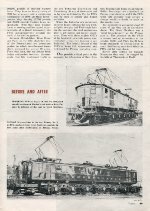 Both photos and captions pertain to seven Great Northern Railroad Y-1 electric locomotives that were acquired by the Pennsylvania Railroad and rebuilt as FF-2's at the latter's Erecting & Machine Shop in Altoona, Pennsylvania. Prominent in the left-hand photo is PRR engine #9622, an AF-16 built by the American Locomotive Company in November of 1951, rated at 1,600 horsepower, and etired in January of 1967. Pictured in the right-hand photo is PRR engine #5, an FF-2 built by ALCo-GE during 1930, rated at 3,300 horsepower, and retired in April of 1965. Description: Here is the front cover of a five-page cover article by Frederick Westing entitled "What's New Under Pennsy Pantographs." It was published originally in the June 1958 issue of "Trains" magazine. Photo by Don Wood. Shown here is a portion of Pennsylvania Railroad engine #5, an FF-2 built by ALCo-GE during 1930 and retired in April of 1965. Description: Here is page one of a five-page cover article by Frederick Westing entitled "What's New Under Pennsy Pantographs." It was published originally in the June 1958 issue of "Trains" magazine, page 45. Photo by Don Wood. Shown here is Pennsylvania Railroad engine #5, an FF-2 built by ALCo-GE during 1930 and retired in April of 1965. 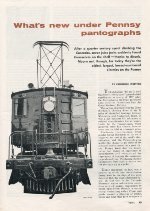 Description: Here is page five of a five-page cover article by Frederick Westing entitled "What's New Under Pennsy Pantographs." It was published originally in the June 1958 issue of "Trains" magazine, page 49. Bottom Photo by Don Wood. Shown here is Pennsylvania Railroad engine #5, an FF-2 built by ALCo-GE during 1930 and retired in April of 1965. Description: Electric Action. Here is a duplicate 35mm color slide (converted to B&W) of a photo by Mr. J.W. Swanberg that was taken in Enola, Pennsylvania, on 29 March 1959. Shown here is Pennsylvania Railroad engine #5, an FF-2 (1-C-C-1) built by the American Locomotive Company for the Great Northern Railroad as number "5015" in March of 1930, acquired by the PRR and renumbered "5" in August of 1956, and retired in April of 1965. This photo is published by Audio-Visual Designs, OHA124.